February for me is all around making sure i'm keeping on track with my goals from January and making sure i'm taking time every single day to look after myself, particularly as it's been such a cold few weeks! My wishlist for February is all about feeling good and continuing to be organised, which is so so important to me. I'm quite literally a whirlwind of chaos if i don't have a good planner! 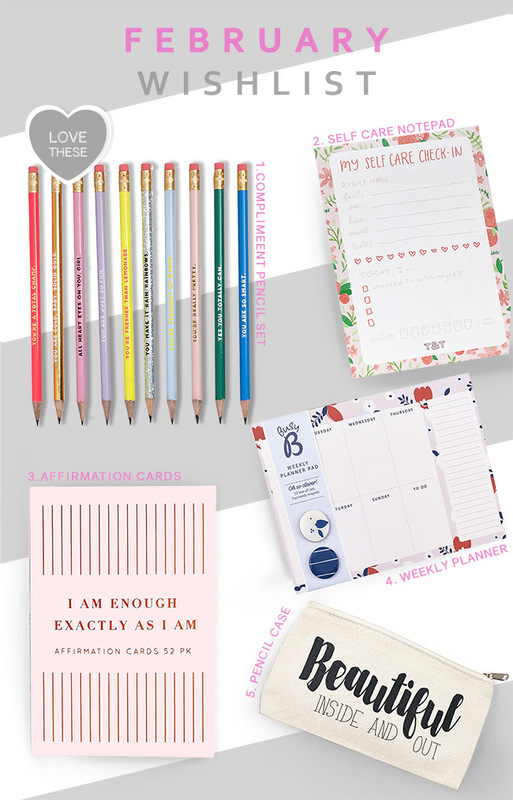 So my wishlist this month includes a weekly planner to keep myself focused each day, a self care notepad to bring some structure to my wellness goals, sparkly complimentary pencils (because who doesn't need a pencil to remind you that you're fresher than lemonde? ), a very beautiful pencil case to keep them all in and affirmation cards, for those moments in the day when you just need to remind yourself that you are amazing! What's on your February wishlist?